At the very end of a network, there is an Internet user. There are more than three billion Internet users around the world. Nearly half of the world’s Internet users are in the Asia Pacific, which is the fastest growing region of Internet users. Users get their Internet connection from access providers, fixed or wireless. This allows them to access content and use a variety of applications. There are many Internet access, content, and applications providers. There are also many enabling organizations that help the Internet to grow seamlessly as a single, global, interoperable network: governments and regulators, industry associations, network operator groups, standards bodies, name registries, and the number registries. 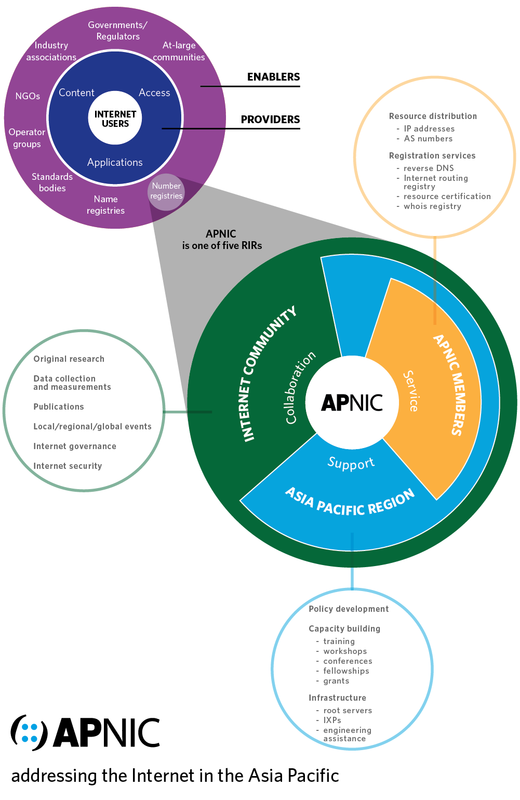 APNIC is one of the five Regional Internet Registries (RIRs) that distribute and manage Internet number resources in the Asia Pacific region. APNIC is a not-for-profit organization that distributes IP addresses and AS numbers to its Members. APNIC also provides other services such as reverse DNS, Internet routing registry, resource certification, and maintaining the APNIC Whois Database. APNIC is a community where any interested party can participate openly in developing policies for managing and distributing IP addresses. APNIC is actively involved in supporting the Asia Pacific region with capacity building and infrastructure assistance projects. APNIC belongs to an ecosystem that oversees the stability, interoperability, and growth of the global Internet. APNIC partners with many organizations to enhance service delivery and to help improve the overall operation and governance of the Internet at a global level.